Israeli singer performs at special event hosted by Israel's UN Ambassador Danny Danon. 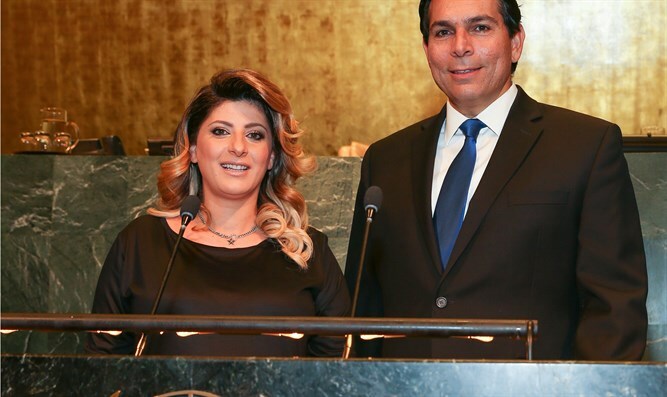 Israeli singer Sarit Hadad performed in the United Nations at a special event hosted by Israel’s Ambassador to the UN Danny Danon marking fifty years since Jerusalem’s reunification. Ambassadors and diplomats from around the world joined hundreds of participants from the pro-Israel community for the special performance. “Tonight, we say loud and clear here in the UN, that Jerusalem is the heart and soul of the Jewish people,” Ambassador Danon said at the event. “Jerusalem is, and always will be, our undivided and eternal capital,” the Ambassador concluded. “I am so proud to celebrate Jerusalem and perform at this exciting event in the UN. This is a special performance that sent an important message as we presented the real beauty of Israel to the international community,” Sarit Hadad said about the event. Before the performance, Yehuda Kaploun, an entrepreneur active in promoting Israeli technologies, noted how Israeli innovations have been a Jerusalem export for thousands of years. “Israeli technologies such as Water-Gen have been making the world a better place since the days when King Solomon created an aquatic system for fresh drinking water, which still exists today in Jerusalem,” Kaploun noted. "This event is part of an ongoing battle for the narrative and in the marketplace of minds about Israel's legitimacy to its eternal Capital Jerusalem", explained Chaim Silberstein - founder and President of Keep Jerusalem which co-sponsored the event, "The fact that we made unapologetic statements in song and in deed at the United Nations underlies Ambassador Danon, together with Keep Jerusalem's relentless resolve to change the narrative on Jerusalem." "This is the first time in history that Israel's national anthem hatikvah as well as Shema Israel was sung in the UN building in the presence of diplomats and a thousand supporters. It is something that we can be proud of and should give us all inspiration to continue this important struggle" concluded Silberstein.